Jesus warns that what truly corrupts a person is not ritual impurity but the impurity of sinful attitudes such as arrogance, greed, sloth, envy, hatred, gluttony, and lust - which lead to sinful behavior. The scribes and Pharisees were powerfully religious in their outward observances, but their outward show didn't match the internal reality of the state of their hearts. They not only neglected the poor and the weak, but they were fanatical towards anyone who challenged their idea of religion. That is why so many of the prophets in past ages who warned about tolerating evil desires and unjust behavior towards one neighbor were mistreated and even killed by their own rulers and people. 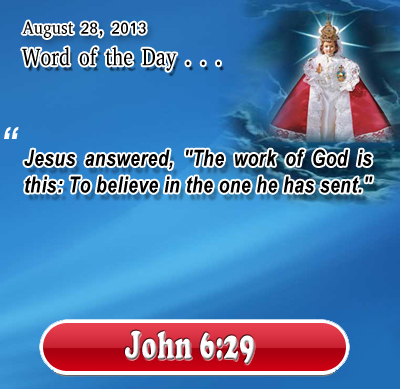 Holy God, we believe that Jesus came to earth, died, and was raised from the dead. Please help us show and share that message with those around us looking to find hope and help. Holy Spirit, open our eyes to those around us who are searching and give us courage and sensitivity to share Jesus with them. Father, we want so much to share in your work; please help us as we rededicate ourselves to it today. In the name of Infant Jesus our Savior we pray. Amen. 27"Woe to you, scribes and Pharisees, hypocrites! for you are like white washed tombs, which outwardly appear beautiful, but within they are full of dead men's bones and all uncleanness. 28 So you also outwardly appear righteous to men, but within you are full of hypocrisy and iniquity. 29 "Woe to you, scribes and Pharisees, hypocrites! for you build the tombs of the prophets and adorn the monuments of the righteous, 30 saying, `If we had lived in the days of our fathers, we would not have taken part with them in shedding the blood of the prophets.' 31 Thus you witness against yourselves, that you are sons of those who murdered the prophets. 32 Fill up, then, the measure of your fathers.